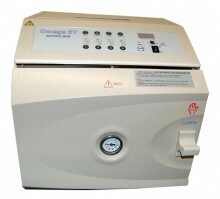 The Omega ST Sterilizer is a fully automatic electric autoclave designed to provide reliable and high quality daily sterilization. Just push one button to control "Filling", "Sterilizing", "Opening Door" and "Dry" phases progressively. Turn on the main power switch and push just one program pad switch and the OMEGA ST commences operation. Automatically, it will fill the chamber with water, heat to sterilization temperature for the specified cycle minutes, and auto-open the door for venting which begins the 30-minute dry phase. Proven components and programming controls make the OMEGA ST very effective for continuous use. Click the button below to add the Omega ST Steam Sterilizer to your wish list.